Play the old version of the game (DOFUS 1). You can log in with Facebook. Download the Ankama Launcher. You can install the 64-bit version of DOFUS, which improves the overall stability of the client. 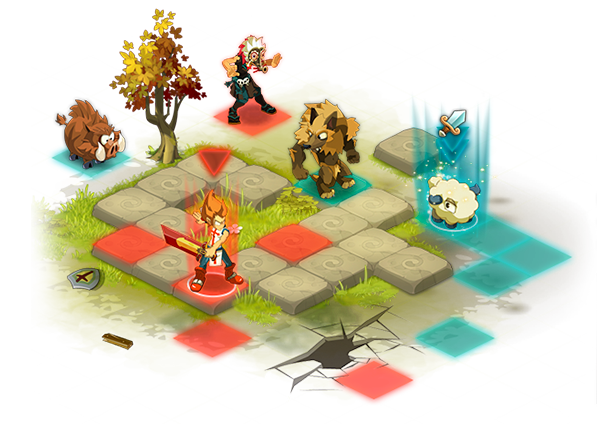 DOFUS is an RPG in which your strategy means the difference between victory and defeat! In this turn-based tactical fighting game, manage your movements and attacks with Movement Points (MPs) and Action Points (APs) within the allotted time, in combats that are as strategic as they are dynamic. Create your own hero in one of the 18 character classes, each of which has its own gameplay and statistics. Set off on a quest to find the Dofus, dragon eggs that will bestow powers and bonuses on your character, and climb to prestigious Level 200. This free downloadable game can also be played in a browser. In this tactical MMORPG, you can work in up to three professions to sell your services and resources in exchange for "kamas", the in-game currency. The Kama Exchange and Marketplaces let players control the game's economy. Dungeons, treasure hunts, monsters, bosses, pets, sidekicks, a player-versus-player (PvP) mode, guilds, nations and even a heroic server (where XP and drops are double but death is permanent) are waiting for you in this online strategy game. Your first steps in the World of Twelve? Support is here to help!